As a potter, I see in one year so many shreds that most people do not see in lifetime. One becomes hardened. If something is not worth of living, or have a flaw behind my tolerance, it easily ends on our ceramic cemetery. Teapots, cups or plates are landing from few meters with piercing brake...going back to the nature. ..on the other hand, many potters (and count me in) learn to appreciate beauty of cracked, warped, bubbled or even exploded ceramic pieces of . Being close to just opened kiln, you can hear "look! what a wonderful crack, it is like crag in the a wind" or "what a beauty-glaze running all around our kiln furniture"...ok, the truth is, that I am always happier with good, well functional pot then with a wonderfully cracked one. 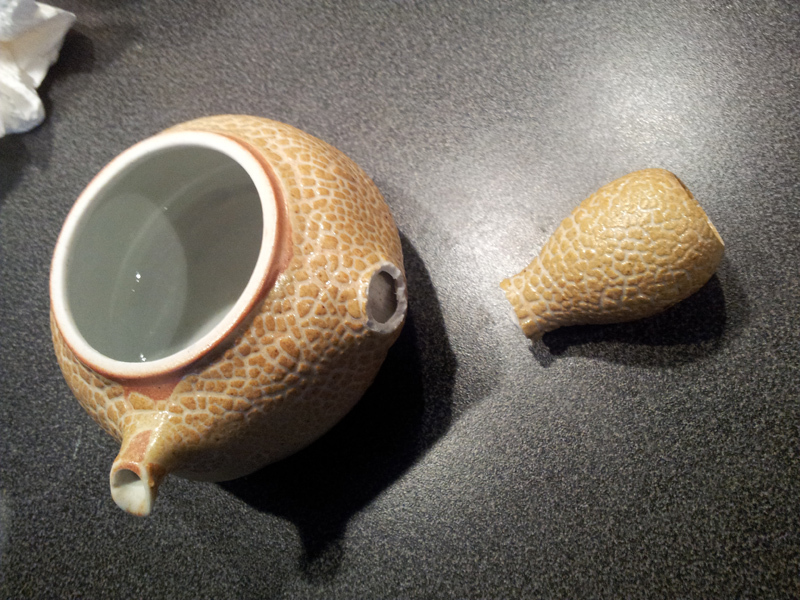 Especially when in 99,5% of cases, the cracked-bubbled-exploded pot means that I have done a mistake somewhere somehow. some, and this is the saddest story, brake in hands of mailman on their road to new home. If you will see half-cracked or warped pots in potters kitchen then know- it is rather common. We do use unperfect pieces (not only, of course!). This way we can see, among others, how particular glaze-clay-shape combination works in daily routine. There is few pieces of tea ware with which I am especially glad that they had to stay with me. They look so well-done that without "small" cracks through I would not probably have them by now. And I would not able to see them age. By using them on daily basis I learn a lot for my future work as well as enjoy the natural beauty of crackling. I have three more pieces which cracked for the same reason as the pot above- the glaze was too strong and literally break the clay. Another kind of crack you can see on this bowl. It is known as "S" crack and it shows on pots during drying. We can blame for that whatever, but it lies between man and clay. I was not sure it I should throw this bowl away or put it into our kitchen shelves. Now I love it for drinking water and use it time to time for bowl tea. Crack on the bottom and the cobweb of fine cracks on glaze plays with my imagination and I like it. And at the end, I would like to share with you Mirka's plate. She made serie of those for FOUZOO, a restaurant we work with. Those plates were glazed without bisque firing, which is quite tricky. One unpleasant thing which can happen is, that water from glaze will stress the clay to the poin, when the piece loose. I love to use this plate for my garden tea sessions. There is a lot of things going on there together with not being too loud for tea. Cracks are not welcome, but sometime pretty inspiring. For sure they keep me on my toes. Few tea friends recently asked about my "drink-a-whole-cake-experiment". Was it boring at the end? Have you enjoyed that tea after two months of drinking it? Even though those questions were not significant to me at that time (no, it was not boring and yes, I enjoyed it) , I realized that maybe also some of my readers are curious to hear some conclusion or closer of that trip. From the date of the original post you already know- the cake was finished few months ago. I had a plan to write about it right ahead but somehow could not find a time to do it. And maybe it is for good. Sometime it is better to talk about a journey when dust is settled. Anyway, if you want to share a story better to do it late then never, right? When I was in the middle of that cake, I realized how much the brew change depending how I prepare it. I thought I will make some conclusions and write about tea ware, steeping time, amount of leaves and how all that physics work. What is the best what one should be aware of, what to avoid. I was also going to talk about tastes, fragrances and delicacy which this "experiment" help me to perceive. Yes, tongue can be trained. But later on I drop it. For me, there are more important things to be focus on right now. I experienced what is quite obvious. But as in many cases - to experience is a different level then to thought -think about it. I experienced how important I am, as the one who prepare and drink that tea, for perception, assessment and judging it. How I feel at that moment, how I slept last night. Who are you at that moment, when you swallow your tea? Have you ever find out how your (momentary) condition affect your opinion on what you have in your cup? I realized that even hour after heavy meal the same tea taste different then in quiet morning on an empty stomach. I realized that when someone describe and judge a tea, it is more about that person in that moment than about that tea. Or at least it is about conversation between those leaves and drinker. If I am in well-being, at the present, I naturaly choose the right leaves for that moment and make the best of it. Tea will then make my well-being deeper and relaxed. For me it means, that to make good tea, I have to stop to set apart "tea" at one side and "me" at another. The experience is more genuine when there is "just" the tea session. After all, when we empty our cup, the tea becomes part of us. This understanding leads me to some thoughts on kung fu cha and the way of tea generally. It is way of self-improvement by doing it- talking, reading, writting just make it more juicy. In ceramic analogy: I try to explain to our ceramic studends that to study ceramic means to do it. Reading books, talking and studying art of others is important but without doing it, it is empty. Do it as well as you can, then it is perfect. You will always know that there is way how to do it better. But you can not be focus on making better clay (tea) - you might want to be focus to make you (to become) better potter (tea maker). At the end, back to my 7542-from-2003 months. Aside of those experiences I wrote above, I would like to mention discovered mouth-feel. I started to feel it after few weeks, the tea was probably make just right. It was like new window in old room. New view, new light. From that moment I can find it there almost anytime. It also help me to distinguish mouth performance of other teas I drink since that. So conclusion- if you are thinking about similar experiment on yourself, be careful. It can change you.